NAND Gate is a redstone logic component added by the Project Red (Integration) mod. It outputs a low signal (0) when all enabled input sides receive a high signal (1). Any redstone signal strength that is not zero is accepted as a valid high input signal (1). A high output signal from the gate is always a redstone signal at maximum signal strength (15). Like all logic blocks added by the mod, the NAND Gate can be placed on any side of a block. When right-clicking the gate with a Screwdriver, it will toggle between various permutations of input configurations where one or two of the inputs are disabled. 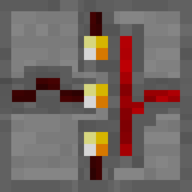 When only a single input is enabled, the gate acts as a "buffer", which amplified a high signal (1) back to the full redstone signal strength (15). It takes two ticks for a signal change to propagate from the input to the output of the gate. This means that as there are 20 ticks in a second, it would take one second for a signal change to propagate through ten of these gates. When the player hovers over the block with their crosshairs, a layout is drawn around the block denoting the names of the in-/output sides. This table is only valid when all three input sides are enabled, denoted here by A, B and C. The input sides are all denoted by IN in the game. NAND Gate (Project Red) has no known uses in crafting. In real integrated circuits using technologies such as NMOS or CMOS transistors, a gate will output the current from the power source, which means that a high signal output does not rely on the voltage of the signal that was input, as these signals degrade when they are fed into many components. By this means, a high signal is always amplified to full strength when it exits a gate component. In the commonly used CMOS technology for integrated circuits, NAND gates are cheaper to implement than AND gates. This page was last modified on 1 September 2016, at 12:23.